The principle of our life is to achieve and live as well as possible a balance between family, economic trade and social engagement. An important pillar is our investments in embedded software & test. People from West and East, their traditions, the technology, curiosity and volition, united in a services mentality are the principles on which the applied management principle is based. The position as a medium-sized family company makes ProIT a strong competitive development team. Through dynamism, flexibility and performance, the requirements and standards of our customers are met quickly without losing sight of the company’s goals. We are trying to build and consolidate a business that has a close and loyal relationship with our customers and our employees as a foundation and a sincere and open communication. As the sole shareholder, the Kartmann family is directly and actively involved in the management of the company. The Kartmann family, decided to found the ProIT Company in 2002 as sole shareholders. Kartmann GmbH is majority shareholder with 75% of shares. Anna-Maria Kartmann is minority shareholder and has 25% of the company’s shares. Roland Kartmann is the company’s manager. Roland Kartmann has been married since 1983 to Anna-Maria Kartmann and they have twin daughters. Their daughters study Master of Science and Engineering at the universities of Vienna and Düsseldorf. 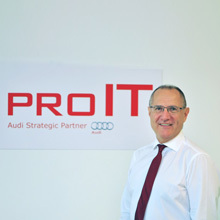 Before 1997, when he started building his own business, Roland Kartmann was the general manager of Parametric Technology GmbH (PTC) and Structural Dynamics Research Corporation GmbH (SDRC) for Central and Eastern Europe, whereby both companies were American software and services companies. Among the services offered by these companies during that time were the development of CAD and FEA solutions and Data Management. Knowing the Romanian, German and American ways of life and the languages spoken in these countries, he understands very well the principles, which are necessary for building a nearshoring business. He has a passionate interest in cars, especially for sports cars and electric cars. He likes to travel, appreciates good food, has a passion for sailing on catamarans and skies in winter.